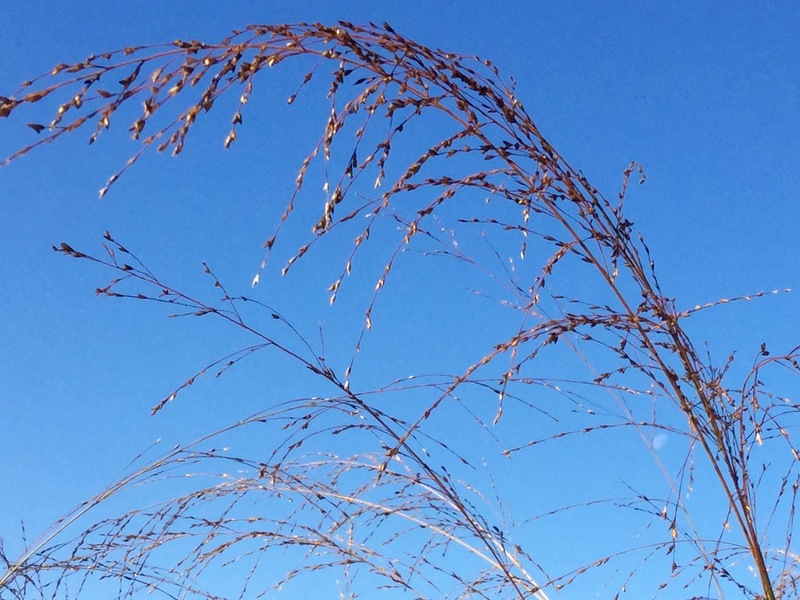 If Molinia caerulea subspecies arundinacea seems a mouthful of marbles of a name, the ornamental grasses it belongs to is as lithe and graceful as a catwalk super model. This is the perfect time to see them strut their stuff in the autumn borders. 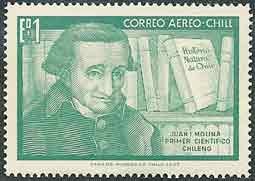 According to the excellent website seedaholic, the genus is named after Juan Ignacio Molina, a 19th century Chilean scientist and naturalist. As a Jesuit priest he was exiled in 1768 and settled in Bologna. ‘Caerulea’ simply means deep blue and describes the colour of the florets. 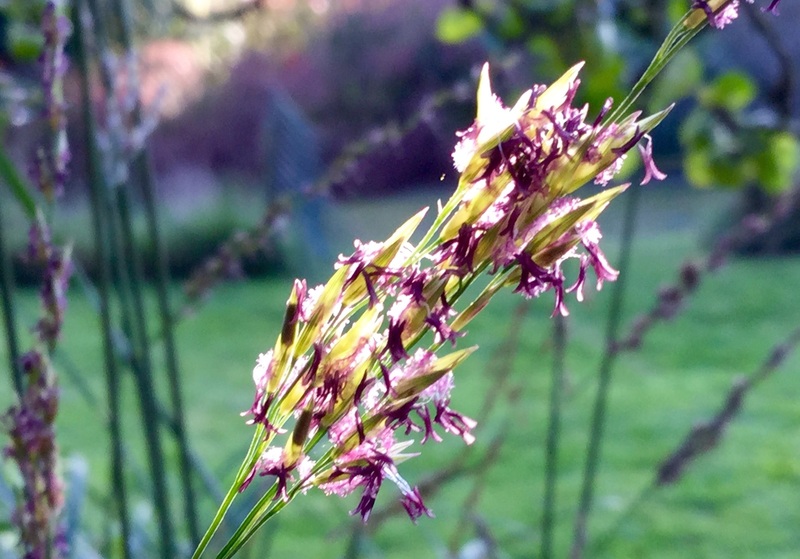 The spikelets are made up of masses of these minute true flowers, hence the common name purple moor-grass. However, in the autumn as seed sets and ripens they turn a rich buttery yellow, soon after stems and foliage follow suit. 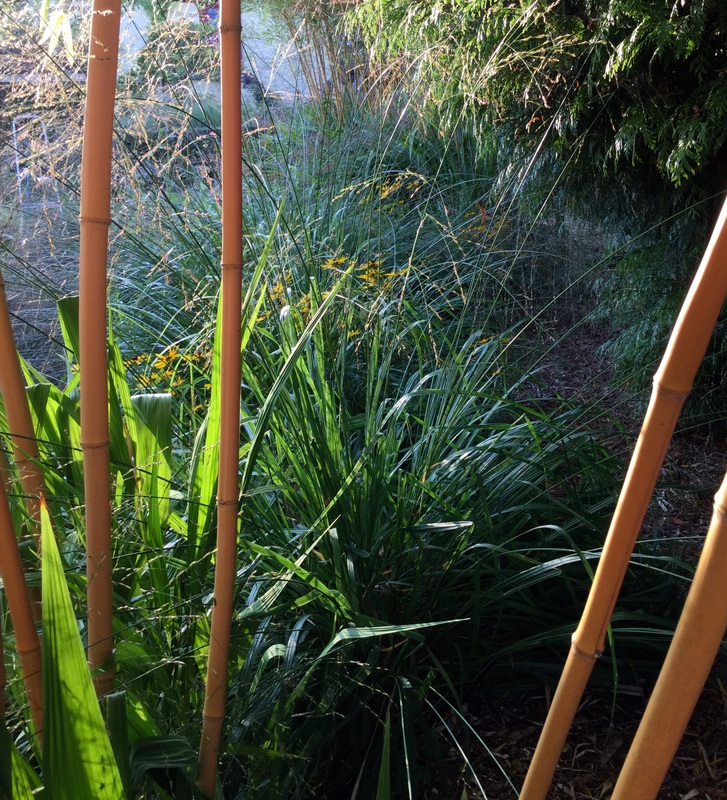 Taller forms at about 2 metres or more are named ‘arundinacea’ as in arundo for being reed-like, although many are found in damp and acidic heath or moorlands they happily tolerate all but the driest soils. 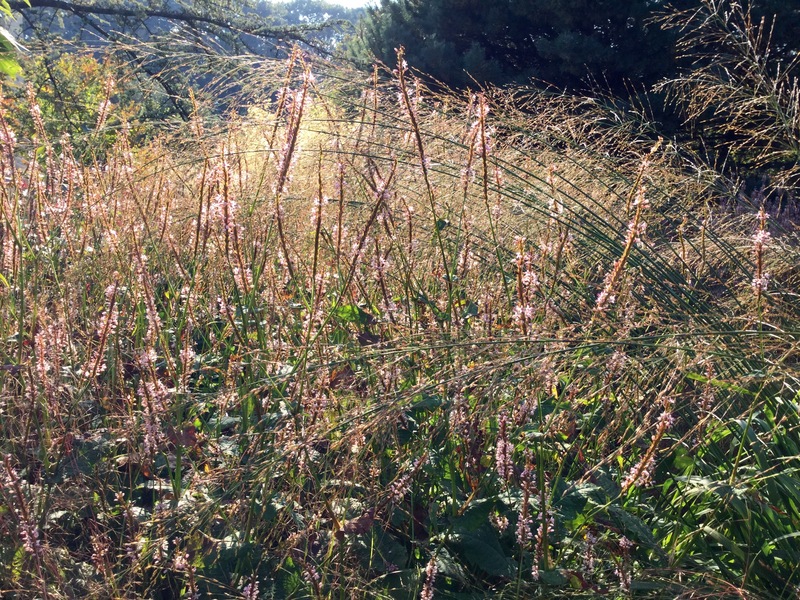 There are two main types of tall purple moor grass, they either have a pronounced upright or arching habit. Both have distinctive flowers arranged in panicles held high above a metre high mound of mid green foliage. Upright forms in autumn look like amber Roman candles and make good vertical accents. They have densely packed flowering heads of elongated seeds. Of the many fine cultivars the classic is ‘Karl Foerster’ but tallest of all is ‘Skyracer’, the one I grow in large numbers is ‘Windspiel’. 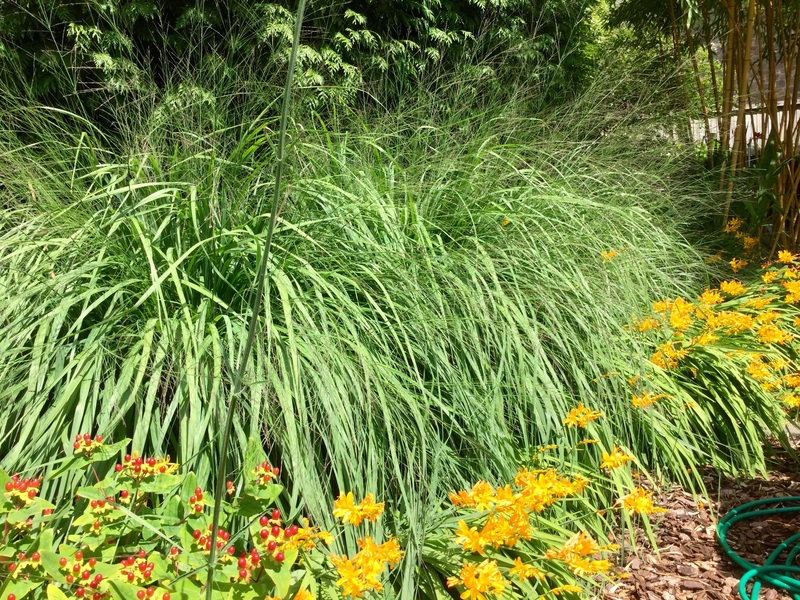 These are one of the best grasses for exposed sites or squeezing into tight spaces. A band of them encircles the seating area in the paddock, it acts as a light raised screen behind the low hedge of dwarf Miscanthus ‘Starlight’. From within the seating area the slim tubular stems create an impression of seclusion without enclosing the space. 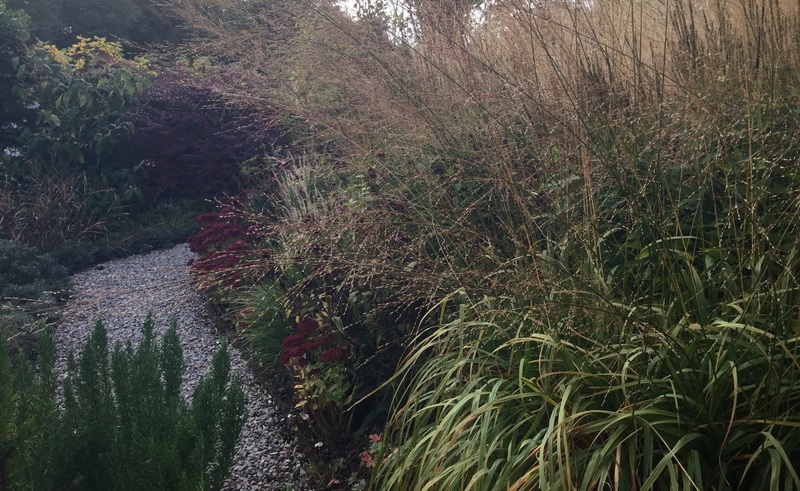 The lower growing miscanthus conceals the mound of leaves once they start to look a bit bedraggled, this also hides the gaps in the planting once the molinia is cut back in December. 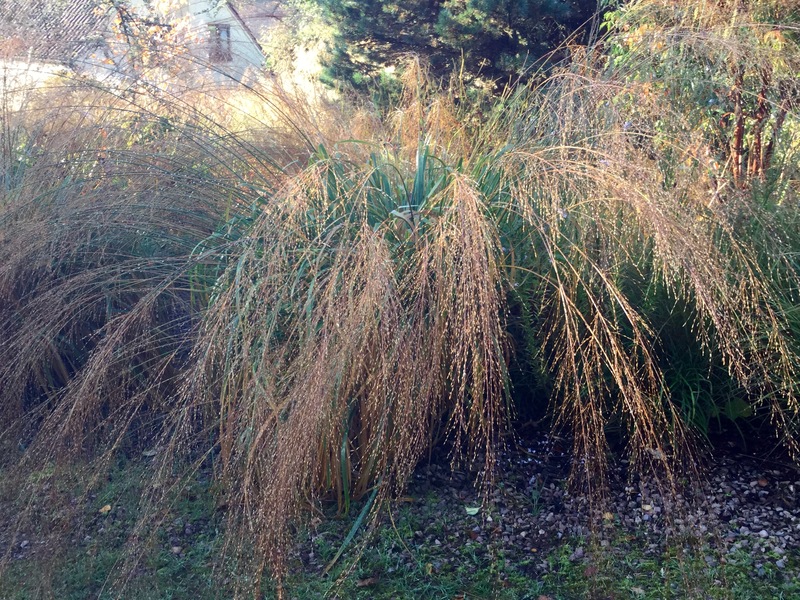 Many deciduous grasses have excellent winter presence, alas molinia is not one of them, but the autumn finale is dazzling. Part of the fun of using them is siting them to allow glimpses of views or planting beyond. A wide range of uniformly coloured light or dark backgrounds help set it off, one of the simplest and most effective contrasts I’ve seen is in a friend’s garden where molinia is planted to be seen against a black shed. The row in full sun in the nursery are bronzed from top to toe by late October, interplanted with Verbena bonariensis makes for a bold combination at this time of year. Before the transformation took place the effect was subtle, we’d had heavy rain that day, ‘Windspiel’ shrugged it off with aplomb. Arrow straight, the flower spikes contrast dramatically with the more pendulous ‘Transparent’. Arching forms of Molinia have distinctly diaphanous charms, the most popular being ‘Transparent’ for its gauze of fine beads. The see-through quality makes them splendid front of border plants, part of their charm is the way they wheel above their neighbours in the wind. A mature specimen laden with rain is a beautiful sight, in the right site they quickly dry and regain their poise. This one planted at a pinch point on the corner of the Round Bed has an endearing habit of embracing passers by, rather than move it or tie it up, I tend to snip off the front portion of the flowering stems. Grown in full sun above makes for a more upright form compared with the one below. Grown in the shade of the big blue cedar this is one of two metre square clumps of ‘Transparent’ laden with rain. On days like this the veterans bow across the path and the drive. Remarkably passing cars don’t bother them, they swish back into position just like a curtain. Practicalities aside, arching forms make the finest veils of all, without the curving stems the effect wouldn’t be as dreamily romantic. ‘Bergfreund’ or ‘Mountain Friend’ has the most extreme arching form, I couldn’t resist the charming name. They’d look stunning tumbling down a boulder strewn slope …. Mine overhang a retaining wall of modest height. They were planted quite roughly on top of the rubble infill with a token amount of loam, as with all new grasses they were watered when necessary for the first year or two. I’m surprised they’ve done so well, perhaps their substantial roots have found their way through to the underlying sticky clay. Here they’re interplanted with Rudbeckia deamii. In late summer the substantial clumps of mid green foliage make a good foil for an unknown yellow crocosmia, in turn it is hemmed in between the edge of the wall and the stout hummocks of grass. Molinia self seeds with gay abandon, especially in moist mulch, so raising large numbers from seed is very easy. Seed from ‘Transparent’ and ‘Windspiel’ was thinly sown in shallow trays in the autumn of 2012, grown on in 9cm pots then planted in nursery beds until this spring when they were transplanted to the meadow. Despite being raised from seed rather than by division, it’s still possible to spot the family resemblance from the flowering spikes. It will be another year before the arching starts in the beadier form. What is noticeable growing them side by side is that there is a further point of difference : those that are from Windspiel colour earlier, more quickly and more distinctly than those that are from Transparent. The meadow has been such a lot of fun this year and full of delightful surprises. 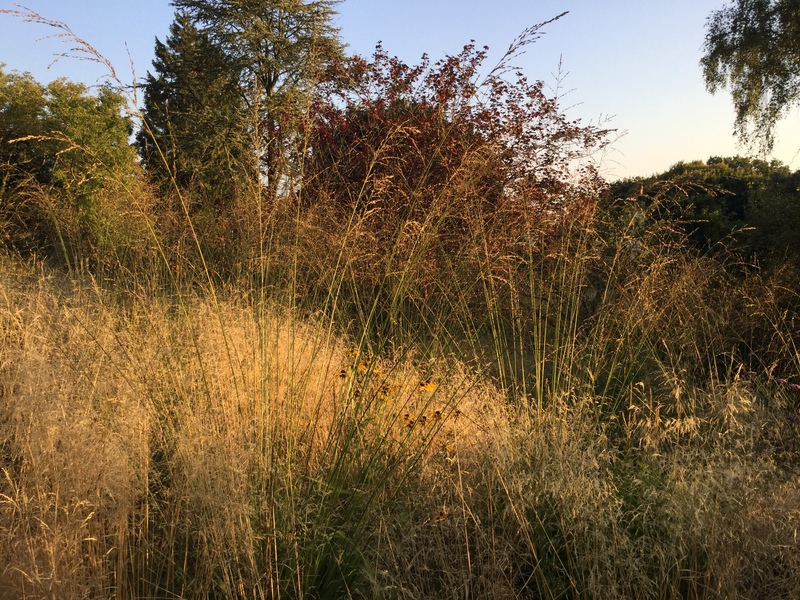 The one drawback is that the molinia show will be over all too soon, leaving the pale understory of deschampsia to take us through the winter and me eagerly waiting for next year’s encore. You have a wonderful selection there, I love the way they give movement to the garden. 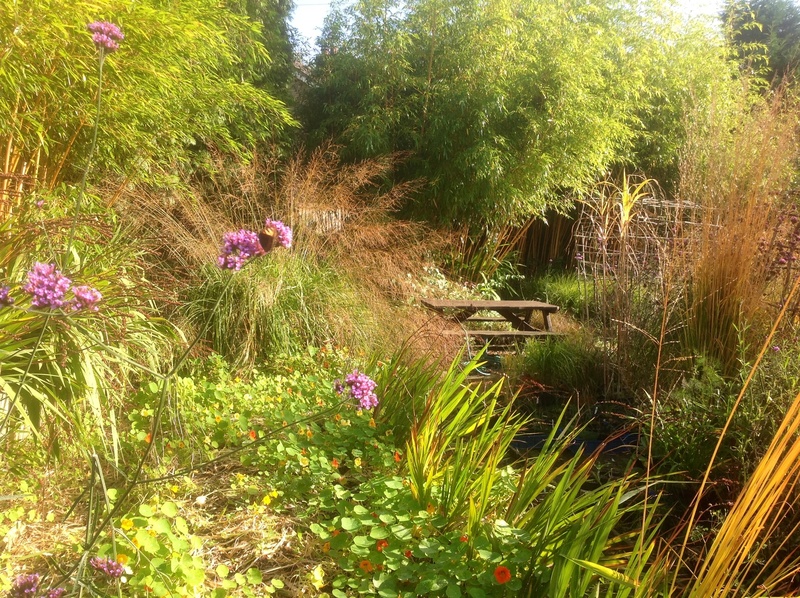 We have a few (4) Miscanthus, tall varieties but the best movement for us is from Stipa gigantea and when the sun is shining through it, it is magical. I think I could be tempted to try a couple of smaller Miscanthus after seeing yours! Thanks Pauline, molinia is a good comparison with the gorgeous Stipa gigantea for that mobile airy effect and see-through quality. 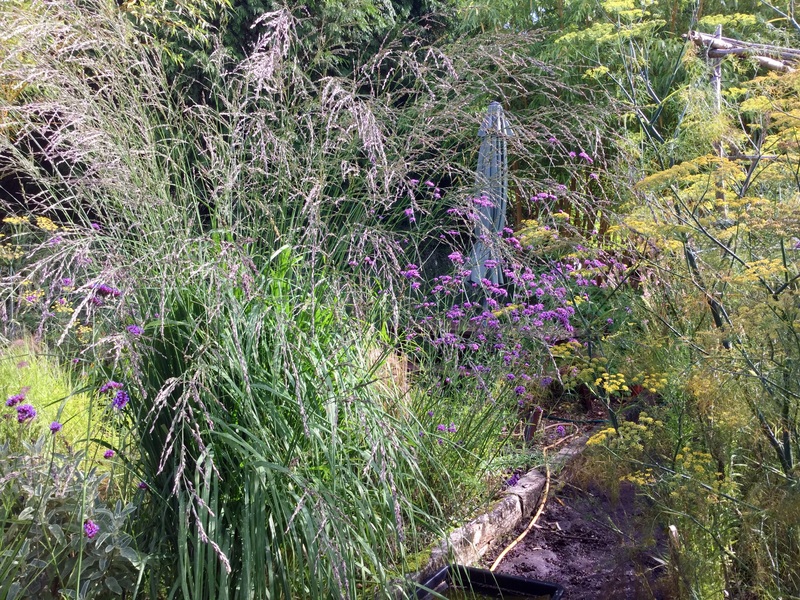 I have a very exposed garden, Stipa enjoy the protection of a conifer while the molinia dance to their hearts content even in a gale. Good to hear you’re looking for a dwarf miscanthus! I bought ‘Transparent’ this year. I must now remember to plant it in full sun, I’d like gently arching stems rather than it getting overly floppy. Planting a series of grasses down a slope is something I’m definitely going to experiment with next year. Transparent is a great plant, I hope you enjoy it. I’ve found forms of it vary a bit from source to source, maybe some nurseries raise them from seed? The other way to encourage an upright habit is to divide them every few years. I’m looking forward to seeing which grasses you choose for your slope. 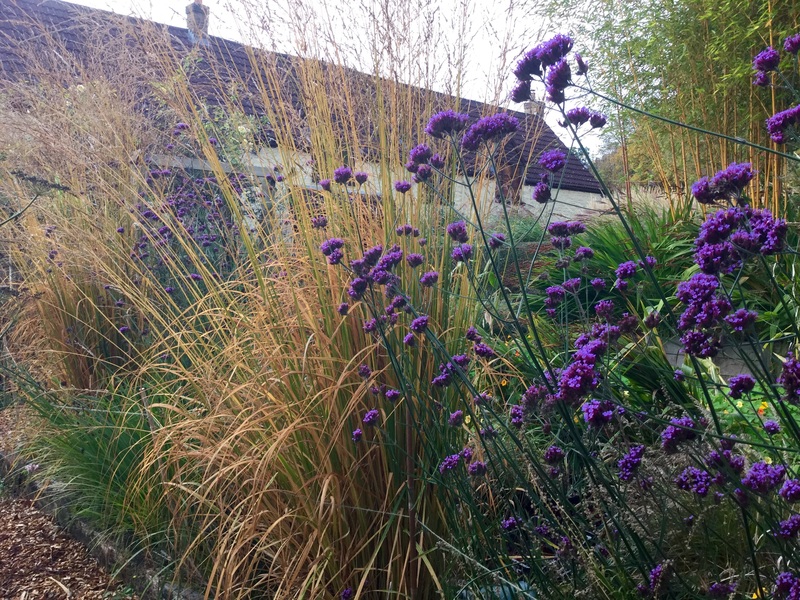 I love that miscanthus planted with Verbena bonariensis and it’s a plant combination I could find room for here. As is the Molinia ‘Transparent’ at the front of a border and great that it gives interest even in wet weather. Lovely ideas. Verbena bonariensis is best friends with tall grasses, fennel works well too – both are easy from seed. You clearly love your grasses Kate, I sometimes wish I had the space to grow them in larger blocks. I have several different ones including Molinia Karl Foerster, you have inspired me to try raising some from seed if they are not to wet! The seeds of Molinia ‘Karl Foerster’ should be fine, left to their own devices they’d be sown about now. Good luck with them! 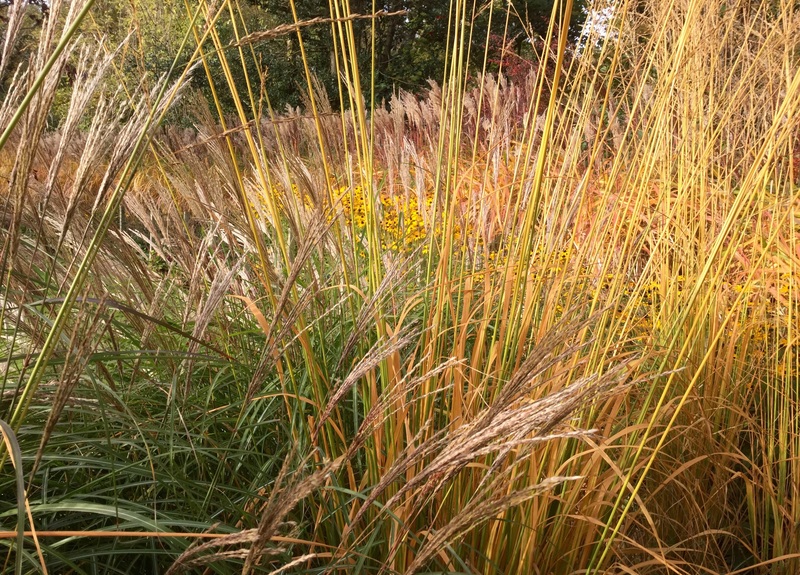 Familiarity has a lot to do with it, some grasses are easy to pin down even to cultivars, but among some of the very similar cultivars of miscanthus I’d be lost without the labels or my planting notes. Just love your plantings! I am wondering how many are banned in NZ because of their rampant behaviour! Unfortunately many of our weeds started off as innocent plants from Britain! i notice many in blogs that are cherished but rampant and banned here! We do have a lot of native grasses and seem to be using much more in plantings. Fashions do change! Good point, Yvonne, you have some strict laws in NZ for good reason. I believe a natural habitat of a species of Chionochloa has been mismanaged and so one of NZ’s native grasses is under threat in the wild? 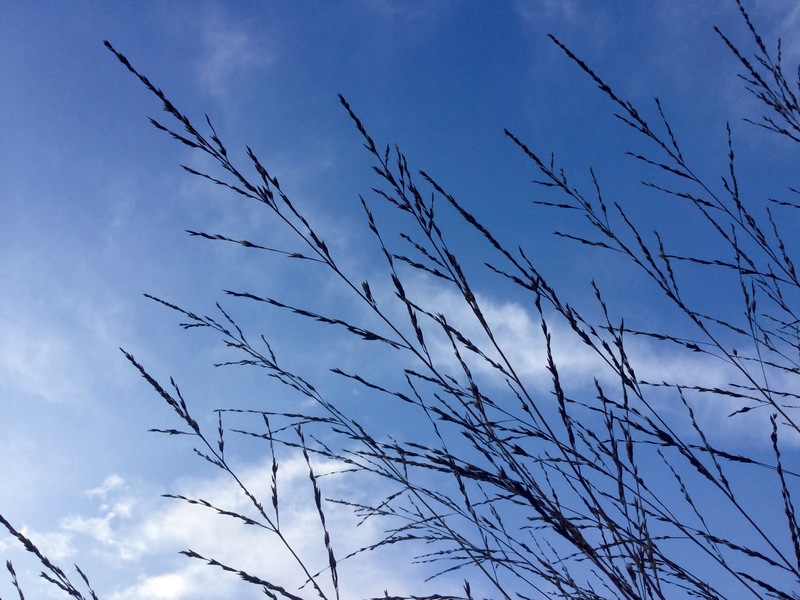 Molinia is one of those grasses that should be used with care in UK gardens. The seedlings prefer particular conditions, squelchy bark mulch is optimum … gravel over membrane puts them off. Seedlings are easy to deal with in the first year or so, once they get their roots down dealing with them can be more of a nuisance. Given the pernicious field weeds I deal with in a rural garden, they’re a breeze. Very beautiful selection, Kate. I’ve got some Molinia too and it’s especially the one by the pond that shines out right now. I like the combination with the Persicaria. I imagine they must look lovely reflected in the water, what a good choice. Hello Kate, sorry I am a bit late, I missed this post somehow. I always find your posts interesting and informative. 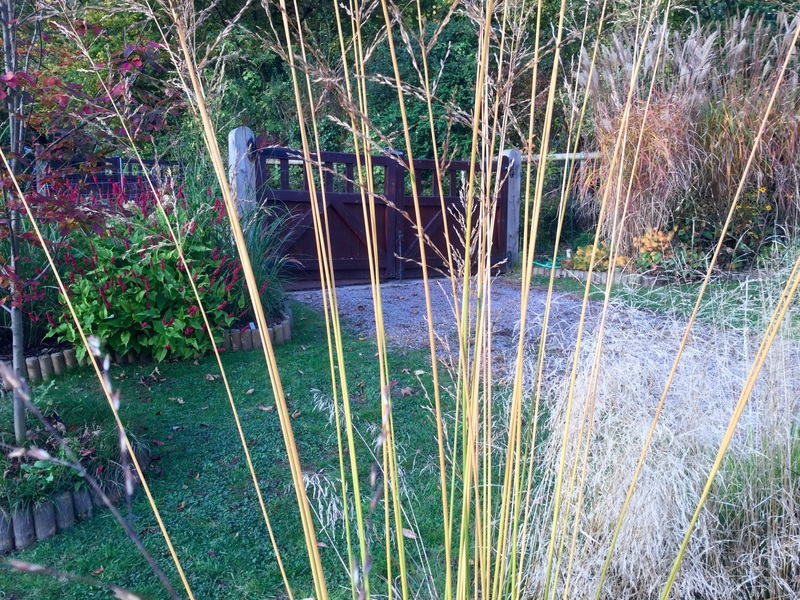 I love having glimpses of your garden and your wonderful use of grasses. I have Molinia Windspiel and Transparent and I love them.both. I never thought of growing them from seed and I can’ t think why I grow seeds of everything else. I shall certainly give it a try. It’s always lovely to hear from you, Chloris, and thank you for your kind comment. 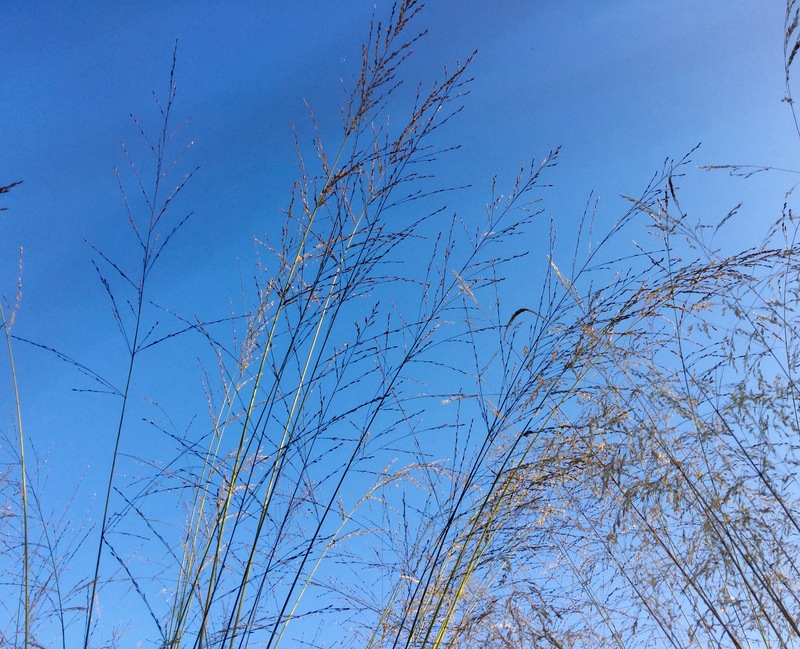 Tall cultivars of Molinia are almost too easy to grow from seed, how interesting that you haven’t noticed an unwanted number of seedlings …. I’m beginning to wonder whether they are only a nuisance in gardens where weeding is neglected. They seem to love my ten year old now ‘composted’ bark paths, hence replacing them this year – makes good mulch though! Funny, I have had no seedlings at all but I have only had the grasses for a couple of years. I will look out for them next year.